An international team of scientists led by João Passos at Newcastle University has for the first time shown thatmitochondria (the “batteries” of the cells) are major triggers for aging, and eliminating them upon the induction of senescence prevents senescence in the aging mouse liver. As described Feb. 4 in an open-access paper in the EMBO Journal, the team carried out a series of genetic experiments involving human cells grown in the laboratory and succeeded in eliminating the majority, if not all, the mitochondria from aging cells. Cells can normally eliminate faulty mitochondria by a process called mitophagy. 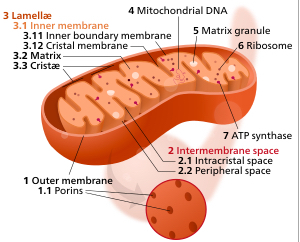 The scientists were able to “trick” the cells into inducing this process in a grand scale, until all the mitochondria within the cells were physically removed. To their surprise, they observed that the aging cells, after losing their mitochondria, showed characteristics similar to younger cells — that is, they became rejuvenated. The levels of inflammatory molecules, oxygen free radicals and expression of genes, which are among the makers of cellular aging, dropped to the level that would be expected in younger cells. The team, involving other universities in the UK and the U.S., also deciphered a new mechanism by which mitochondria contribute to aging: mitochondrial biogenesis, the complex process by which mitochondria replicate themselves, is a major driver of cellular aging. This work was funded by the UK Biotechnology and Biological Sciences Research Council. Cell senescence is an important tumour suppressor mechanism and driver of ageing. Both functions are dependent on the development of the senescent phenotype, which involves an overproduction of pro‐inflammatory and pro‐oxidant signals. However, the exact mechanisms regulating these phenotypes remain poorly understood. Here, we show the critical role of mitochondria in cellular senescence. 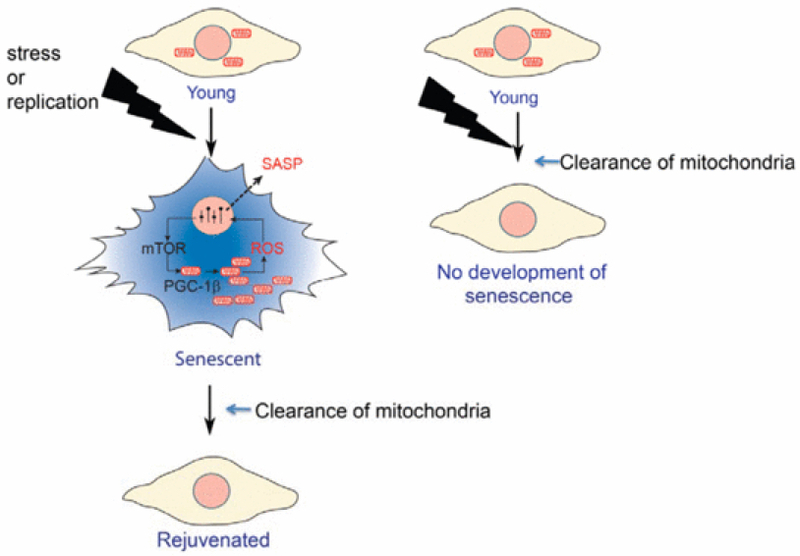 In multiple models of senescence, absence of mitochondria reduced a spectrum of senescence effectors and phenotypes while preserving ATP production via enhanced glycolysis. Global transcriptomic analysis by RNA sequencing revealed that a vast number of senescent‐associated changes are dependent on mitochondria, particularly the pro‐inflammatory phenotype. Mechanistically, we show that the ATM, Akt and mTORC1 phosphorylation cascade integrates signals from the DNA damage response (DDR) towards PGC‐1β‐dependent mitochondrial biogenesis, contributing to a ROS‐mediated activation of the DDR and cell cycle arrest. Finally, we demonstrate that the reduction in mitochondrial content in vivo, by either mTORC1 inhibition or PGC‐1β deletion, prevents senescence in the ageing mouse liver. Our results suggest that mitochondria are a candidate target for interventions to reduce the deleterious impact of senescence in ageing tissues. Researchers at Mayo Clinic have discovered that senescent cells — cells that no longer divide and accumulate with age — shorten lifespan by as much as 35 percent in normal mice. Removing these aging cells delays tumor formation, preserves tissue and organ function, and extends lifespan without observed adverse effects, the researchers found, writing Feb. 3 in Nature. As the immune system becomes less effective, senescent cells build up and damage adjacent cells, causing chronic inflammation, which is closely associated with frailty and age-related diseases. Van Deursen is a co-inventor of the technology that has been licensed by Mayo Clinic to Unity Biotechnology. Mayo Clinic and Van Deursen have a financial interest in the technology. Cellular senescence, a stress-induced irreversible growth arrest often characterized by expression of p16Ink4a (encoded by the Ink4a/Arf locus, also known as Cdkn2a) and a distinctive secretory phenotype, prevents the proliferation of preneoplastic cells and has beneficial roles in tissue remodelling during embryogenesis and wound healing. Senescent cells accumulate in various tissues and organs over time, and have been speculated to have a role in ageing. To explore the physiological relevance and consequences of naturally occurring senescent cells, here we use a previously established transgene, INK-ATTAC, to induce apoptosis in p16Ink4a-expressing cells of wild-type mice by injection of AP20187 twice a week starting at one year of age. We show that compared to vehicle alone, AP20187 treatment extended median lifespan in both male and female mice of two distinct genetic backgrounds. The clearance of p16Ink4a-positive cells delayed tumorigenesis and attenuated age-related deterioration of several organs without apparent side effects, including kidney, heart and fat, where clearance preserved the functionality of glomeruli, cardio-protective KATP channels and adipocytes, respectively. Thus, p16Ink4a-positive cells that accumulate during adulthood negatively influence lifespan and promote age-dependent changes in several organs, and their therapeutic removal may be an attractive approach to extend healthy lifespan.